Monday UPDATE UPDATE: To no one's surprise, final numbers a skosh lower than their Sunday estimates. Sunday UPDATE: Showing uncommon strength in its debut frame, Prisoners took the title this weekend, surging 29% Friday-to-Saturday and nailing down the adult demo with nearly equal numbers of men (48%) and women (52%). Its A- Cinemascore – up Friday-to-Saturday as well – suggests strong legs in the weeks to come — greater success at the box office could translate to Oscar nominations. The weekend's other new release, Battle of the Year, popped and locked its way to a pathetic $5M opening. Adults rejoice. Hollywood has you in its sights for the next several months as the studios dole out films they deem worthy of consideration for the gamut of end-of-the-year awards' shows. 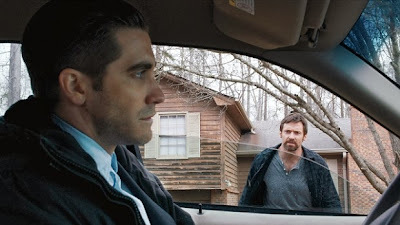 And while Jake Gyllenhaal deserves consideration for his work as the dogged detective tasked with bringing Hugh Jackman's abducted daughter back home, the rest of Prisoners – while strong – isn't quite at nomination level. But those over the age of 25 should take plenty of seats to see the Jackman/Gyllenhaal combo, though the dark subject matter could temper the take. 1. Prisoners $18.75M (↔) - Projecting a debut higher than Gyllenhaal's End of Watch but lower than 2010's The Town, right around the level of Moneyball. Those three adult-drawing dramas released in mid-late September. 2. Insidious: Chapter 2 $16.5M - As with all horror flicks not titled: The Conjuring, expect a 60% dive in weekend number two. 3. Battle of the Year $7.5M (↓) - Step Up ripoff could tank in spectacular fashion. 4. The Family $6.75M - Its 38% Friday-to-Sunday drop, plus dreadful grade C Cinemascore, suggests wretched WOM. 5. The Butler $3.75M - Over $100M banked on its way to the Oscars.